Bob and Sara Rothschild left the San Francisco Bay area in 1976, moved their family to Urbana, Ohio, and began farming raspberries. After several years of success with their pick-your-own raspberry operation, they decided to make raspberry preserves with excess berries. That simple decision led to a specialty food business producing dips, spreads, mustards, sauces, preserves, condiments and sweet toppings. The Rothschilds focus on “open and serve” foods that add easy elegance to home cooking. That is my kind of gourmet food! Someone aptly nicknamed horseradish “white heat” for its ultra-hot flavor. Although I’m a fan of spicy foods and condiments, plain horseradish is a little too much for me. I prefer horseradish sauce as a complement to beef or chicken, and as a tasty spread for sandwiches. 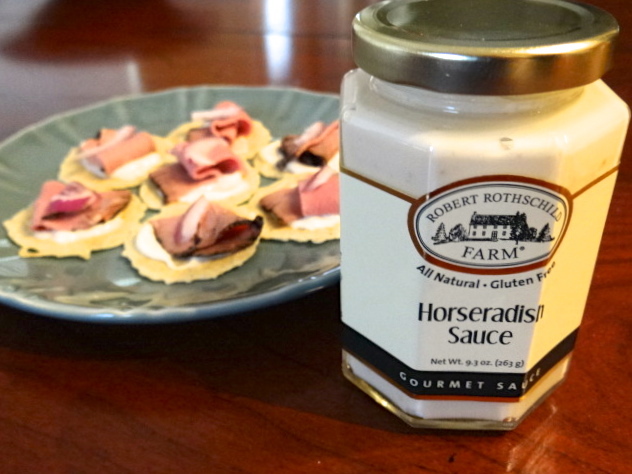 We picked up Robert Rothschild Farm Horseradish Sauce at Central Market. I sampled it straight from the jar, and loved the creamy texture and taste. I put the “open and serve” concept to the test with about the easiest snack you can imagine. The idea came from the 34° Crisps website and it was a smashing success. Try this at home soon! Spread crispbreads with horseradish sauce. Top with roast beef and onion. It was really hard to stop eating these little gems. They will definitely be in appetizer rotation at our house. Easy and delicious — genius! Robert Rothschild Farm has plenty of tempting gourmet products. Balsamic Caramelized Onion Spread just might be the next one on my list.